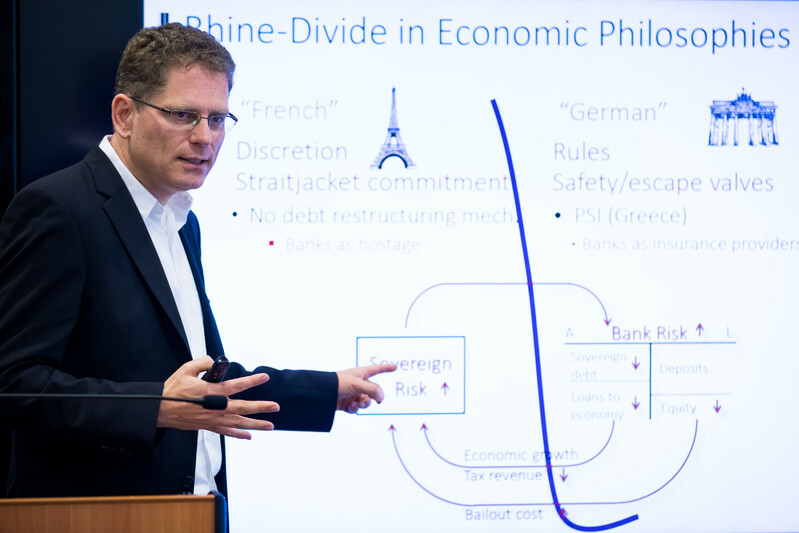 The euro crisis is a result of philosophical differences among the founding countries of the eurozone, Markus Brunnermeier, Harold James, and Jean-Pierre Landau argue in their book “The Euro and the Battle of Ideas,” presented by Brunnermeier on June 8 at CEU. Brunnermeier is Edwards S. Sanford Professor of Economics at Princeton University and director of the Bendheim Center for Finance. 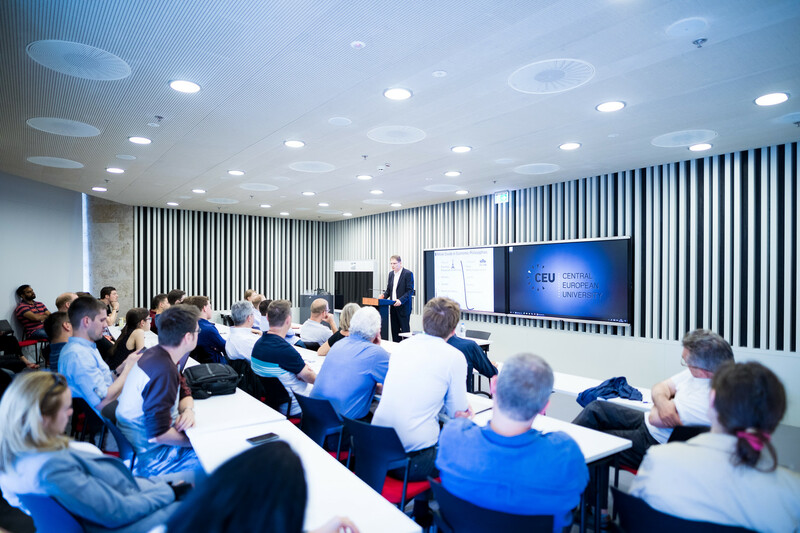 The event, organized by the CEU Department of Economics, CEU Business School, and the Political Economy Research Group, was moderated by Professor Julius Horvath, dean of CEU Business School. Markus Brunnermeier speaks at CEU. Photo: CEU/Zoltan Adrian, Kepszerkesztoseg. The French philosophy and the German philosophy battle for prevalence in Europe in the economic sphere, according to Brunnermeier. They differ in four dimensions. The first concerns the role of the state in the economy. In the French view, the state tends to play an active role in the economy. According to the German philosophy the state plays by the rules and intervenes only in the times of crisis, and then withdraws. The second difference refers to the attitude of the state towards supranational shared liabilities. In the French philosophy, solidarity and openness to joint liability are acceptable, while in the German, these are not acceptable. Third, the French philosophy emphasizes liquidity, while the German emphasizes solvency. Finally, in the French philosophy, the Keynesian stimulus implies that reforms are initiated in “the good times.” By contrast, in the German tradition, reforms are implemented in “the bad times,” as the crisis shifts the balance of interests and makes reforms possible. Moreover, he argues that significant power shifts have occurred in Europe after the Euro crisis and, therefore, can enable Europe’s future survival. With thanks to Ekaterina Paustyan, a doctoral candidate in the Department of Political Science, for this writeup.